Lets make things a little lighter after that last post… With a pigeon post! For centuries, countries have aligned themselves with animals in attempt to capture the essence of the animals nature and characteristics to reflect what their country brings to the table. Animals such as the Lion and the Tiger give off the air of predatory pride, other countries choose indigenous species such as the Ganges River Dolphin or the humble Dugong. America may have the Bald Eagle screeching freedom, but the U.K. has the humble Pigeon cooing for empty fish and chip wrappers. Do not underestimate the mighty power of the pigeon with its long, deep history and long-standing significance. Reader; you may disagree with my writing, but hopefully after you’ve read my post today you’ll have a better understanding about why myself amongst others believe that pigeons are great. There are literally hundreds, nay, thousands of pigeon breeds. The common mangy pigeon we see strewn about towns and cities are actually a branch of Rock Pigeons or Rock Doves. We all are accustomed to the mixed bag vermin birds that scatter the world with their silly demeanour and discernible agenda, nevertheless pigeons exist as a comrade to us. So keep with me, I promise this is more exciting than not. Being the first bird domesticated, the pigeon has been used as a way of communication for centuries. Most notably, the pigeon seems to have a homing device in it’s brain meaning that they can return to a place even when they have been displaced for thousands of miles. The start of using pigeons as a general use of war communications starts back in the late 19th century during the Franco-Prussian war. After the Prussians destroyed usual form of communication for the French, being wired telegraph, the pigeon stepped in. While under siege the pigeon delivered messages of all importance outside to as far as Tours, a 240km trek for the birds. Pretty nifty little fellas! Their war time service does not end in 1871, these birds were frequent flyers in both the world wars. Often shot at, the pigeons were mostly undeterred by gunfire often showing up at their designated destination, and in some cases saving many lives. 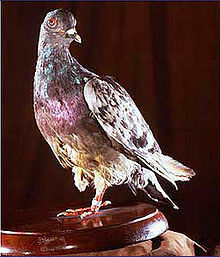 Some famous pigeons include Cher Ami, who received the Croix de Guerre for her outgoing performance at Verdun. She is among the 32 pigeons ever to receive medals for valour and bravery during warfare. Cher Ami, the recipient of the Croix de Guerre. Isn’t she majestic? Pigeons were also responsible for some of the first aerial photography in the First World War. Pigeon post, especially the use of war pigeons was terminated in 1957 after the dwindling numbers of homing pigeons after the war. I could go on and on about how pigeons saved us on many occasions during wartime, but I feel like that would not be too great. Well Doves are, and they are technically pigeons. Obviously the go to here for Dove’s role in the Bible is in Genesis, with Noah’s Ark. Noah sends forward a dove on numerous occasions after the punishing rainfall to find land, and hopefully the recession of the flood waters. Pretty important, but they aren’t just a religious aspect for Christianity. In Sikhism, high priest and warrior Guru Gobind Singh was known for his affiliation with rock doves and so feeding pigeons is not uncommon in commemorating him. Some religious groups, specifically in south central Asia, believe that when someone dies, their soul is carried by a bird, and in most cases pigeons there for flocks of pigeons around temples are fed in the effort to care for ex-loved ones. Another reason to care for these birds; they could be watching over you in a way that’s not just in awe of your sausage roll. Believing pigeons have emotions is down to the individual, but I see no reason for birds in general not to have emotion. In exhibiting certain behaviours, it is pretty clear (to me) that they do indeed have emotion. Whether it’s pigeons preening each other, sharing food and resources in a pigeon-y friendship or traceable traits such as elevated heart rate and muscle tension when it comes to fear; pigeons display many different traits that can coincide with emotion. Much like us humans do. However, behaviour traits can be linked to emotion, they don’t always prove that emotion is present. So I leave it up to you to make a decision on whether you think these funny little birds can love. Yes, they bob around and walk in circles and seem to have no regard for personal space but there is reason for all these inpigeonous traits. There have been studies, the most recent in 2017, stating that pigeons are more aware than space and time than we first imagined. Studies at Oxford university have shown that pigeons share the development of generation to generation cultural development, but instead of means such as behavioural development, efficiency of their nature has improved making them more dynamic in navigation, flight and intelligence. There are published papers on this topic which talk more in depth about animal behaviours and pigeons with more scientific fact and figures than I can conjure – and I’ll probably leave it to them as well – that are floating about out there. Here is a great example! I don’t know about you, but when I’m off galavanting around the planet I do get homesick from time to time. Maybe this is where my love of pigeons stems from. There is something nice about feeding birds, especially pigeons. The nice thing about feeding pigeons is that it can be done all over the word. Every continent possess the pigeon so being able to have a cloud of grey swarm over bird seed is a sight familiar to most major cities, and for that I am grateful for pigeons. Thanks birds for keeping me a little more sane.